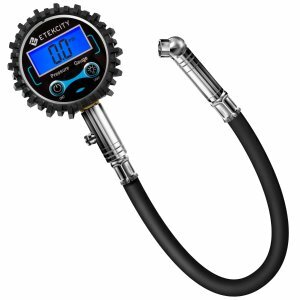 Amazon.com offers the Etekcity Digital Tire Pressure Gauge 230 PSI with Backlit LCD for $13.99 via coupon code V94IIY5U . Features: Accurate digital display with high precious of 0.1 PSI, 4 settings with range: 0-230PSI / 0-15.85Bar / 0-16.17Kg/cm²/0-1585KPA; use sensors to get more accurate readout, no more guessing with analog gauges. Simply press the button to release extra air, easy to get the right tire pressure for accurate adjustment. Reduce tire wear and improve performance of vehicles, suit for car, truck, motorcycle, bike,etc.